Economy Minister Eli Cohen (Kulanu) arrived in the northern Jordan Valley Sunday to observe the construction work of the Jordan Gateway project, which will include a new bridge between Israel and Jordan, as well as a joint industrial zone. The project, which was frozen for many years, finally began to gain traction in recent months. 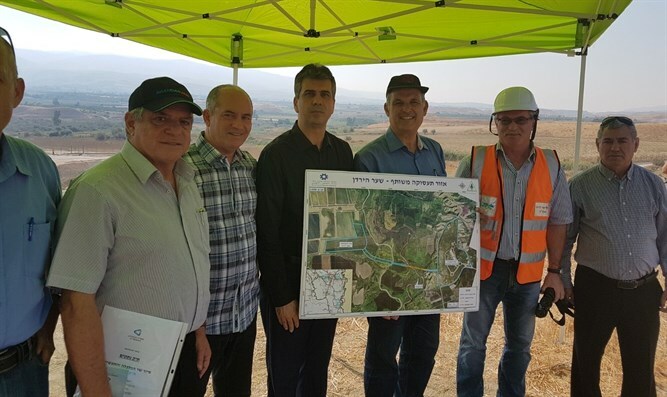 When the construction is completed, it will include two industrial and employment zones on both sides of the Jordan River, which will be connected by a new bridge. The industrial zone will encompass 700 dunams (172 acres) of Israeli and Jordanian factories on the Jordanian side. An employment area and a base for the transfer of goods will be established on an area of ​​about 250 dunams (61 acres) on the Israeli side. The bridge is expected to be completed by April, 2019. The industrial and employment zones will be completed only in 2019. Upon completion, a joint free trade zone between Israel and Jordan will be established, which will remove the need for transit visas and passports to enter the territory and promote commercial and economic activities. 10,000 Jordanian workers are expected to be employed in the industrial zones when they open, and more will be employed later on. Minister Cohen said following his tour of the site: "the completion of the construction of the bridge and the establishment of the joint employment zone is in the mutual interest of the two sides in order to strengthen ties, and not only in the economic dimension." "The joint industrial zone will strengthen the ties of peace, strengthen the resilience of the communities in the region and bring economic and social prosperity to both countries, to residents of both sides of the Jordan River and to the entire region," Cohen added.